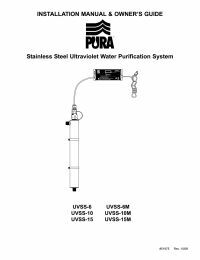 The Pura 89502 UV Lamp is the heart of the UVSS & UVSS-M systems, which can disinfects from 11 to 29 gallons per minute, when prefiltration is effectively maintained. It is also important to replace your quartz sleeve if damaged or if it cannot be cleaned by non-abrasive methods. Replacing your Pura UVSS-15 & UVSS-15M Lamp every year is important to ensure consistent water quality. Though UV lamps rarely burn out, they will lose their ultraviolet effectiveness (disinfection power) over a 12 month period.